Just looking for Dr. Jones' Inner Circle? Click here! Techniques For Healing Your Pet At Home"
Have you made any changes to the way you are providing health care for your dog or cat? Your beloved pet could be at risk of Cancer, Auto-immune Disorders, Seizures... or a host of illnesses in our pets that were once considered rare. My name is Dr Andrew Jones. I have been a dog and cat Veterinarian for almost 20 years. I am the founder of a charitable society "The Second Chance Animal Shelter", and I have studied and published extensively on Alternative Veterinary Care. I have spent thousands of hours exploring ways for pet owners to administer first aid, improve behavior problems, and even treat illnesses using readily available household products. My book was first published on-line, in digital (e-book) format, in May of 2004. The book is called "Veterinary Secrets Revealed". I publish a daily newsletter called 'Veterinary Secrets', I have authored countless pet health articles (just Google my name, Dr. Andrew Jones DVM), along with numerous digital books, over 40 how-to videos on alternative pet health care, conducted expert interviews, and held dozens of online seminars. I have created the first ever Alternative Pet Health Home Study Course for pet owners called the Veterinary Secrets Revealed Complete Home Study Multimedia Course. He didn't seem to feeling very good one day, so I did a blood test on him thinking he had a tooth infection. I quickly found out that he had a spleen tumor in an advanced stage. I did all the "right" things - or so I thought. After grieving, I came to realize that I may have contributed to his death, because I believed only in conventional veterinary medicine. It was very tough to acknowledge that I had played a role in him dying at too young of an age. I came to realize that I and most other Veterinarians were not "getting it" - that in the process of trying to heal pets through technological advances, we were actually making them sicker! ...are you making these same mistakes? The food that Hoochie ate was NOT naturally preserved. The unnatural preservatives played a role in the cancer. A very popular NSAID is Rimadyl. It has resulted in all the above reported side-effects, including death. In fact it was first created as a human anti-inflammatory product, but due to the incidence of serious liver side effects in clinical trials, it was pulled from the human market. The drug company, Pfizer, then brought it back to life in the pet industry. "Yes, I as a knowledgeable veterinarian with 15 years of experience, contributed to my pet's death." I truly believe that those were the 3 biggest factors in Hoochie getting cancer. NO, I can't prove it, as many of my colleagues like to say... but I have some pretty strong beliefs. Especially based on what I have seen with THOUSANDS of dogs and cats in Veterinary practice. It seems that every single year I was asked to treat more and more pets for cancer, allergies, a lot more skin and gum disease, arthritis, kidney problems... and especially auto-immune diseases - diseases in which your pet's own immune system turns on them and begins attacking their healthy blood and skin. It seems that on average, the dogs and cats that were being brought to me for serious diseases such as cancer an immune system disorders are much, much younger than ever before. But don't just take my word for it. Here is what Dr. Michael Dym has to say. Dr. Michael Dym, DVM: "Over the past 40 years and 17 generations of dogs and, cats we are seeing tremendous increases in chronic ill health in our pets that was rare back in the early 1960's. Most of these illnesses revolve around breakdown in our pets' immune systems, and include chronic skin/ear allergies, digestive upset, thyroid/adrenal/pancreatic disorders, seizures, gum/ teeth problems, degenerative arthritis, kidney/liver failure, and cancer across all ages and breeds. We are also seeing a record number of behavioral and emotional disorders including alarming and unexplained fears/aggression, as well as difficulty focusing/training and paying attention. The two biggest factors in our pets' population health decline over these generations has been the severe overuse of multiple vaccines and nutrient poor and toxin filled commercial pet foods. We have also failed to address the underlying cause of disease by only suppressing symptoms with antibiotics, cortisone and related drugs, so the disease progresses and goes deeper." Take charge of your pet's health. Don't just let others make decisions for you. by becoming an EMPOWERED pet owner. I'd like to help you become an empowered pet owner. On this FREE DVD, you'll learn the fundamentals of holistic dog and cat home health care. In the video, I demonstrate and discuss the most important aspects of at-home pet healing. I KNOW my DVD will help you - because I've already helped THOUSANDS of pet owners just like you take better care of their pets, with my books, my course, and my videos. It has a role indeed, trauma, surgery, and some select treatment protocols the Allopath can be of great service. But not as a rule, and not for just about everything we seek the help from a vet for. Thank you again Dr Jones for a very informative book!! " I can't tell you how much I appreciate having this reference book. I recommend it to every pet owner. It's a must have. Let me know if there is anything I can do to help you with your "problem" with the association. Thank you." I have found many things very informative in this book. My cats respond very well to the marine fish oil, I feel I am giving them the best thing for their health, and my cat with eye infections completely healed after using the black tea and it was soothing and she didn't mind being treated." "I found your Ebook 'Veterinary Secrets Revealed' online last year. I got your email minicourse first and, though I already knew some of the remedies, I only knew a few. Due to several health problems of my own, I take a number of medications. I'm usually very careful but once in awhile a pill drops on the floor and then I'm off on a mad journeys to find it. I finally called in a sighted person to help but the pill was simply not to be found. Then I had a moment of panic. The pill was a diabetes med which I knew, if he'd ingested it, would play havoc with his blood sugar and could lead to serious consequences. But since I knew from your course and Ebook how to induce vomiting with hydrogen peroxide, I gave him a spoonful as instructed and waited 15 minutes with him outside. (Thank goodness it was a beautiful day so waiting was no discomfort for either of us. After he had not vomited, I gave another round of the hp and it started. Being a fairly anxious person and since, after all, this dog was my eyes, I got him to the vet as quickly as possible. The vet, who I knew to be open-minded though not very knowledgeable about alternative remedies, told me he was impressed at how well I handled things. He did some tests and kept my dog overnight and I'm not sure exactly what else he did but my guide dog was great the next day. To read more of the wonderful comments other clients have sent me, go here. Well, there isn't one. My Healing Your Pets At Home DVD is completely free to you. However - I do ask that you cover the shipping and handling charge, of only $4.97. Yes - read that again: if you aren't satisfied, I'll refund 100% of your shipping cost, and you can KEEP the DVD. Play on any DVD Player: this DVD is playable on any DVD player, or on your computer / laptop DVD drive. The DVD also comes with the DOWNLOAD Version of the video as well! With your DVD order you'll get the download version of the video - so you can watch it on your iPad / Tablet / phone (works on any device)! You do not need to download the video, as you'll still be shipped the DVD - it is for your convenience only. NEW OPTIONAL BONUS: Get 1 MONTH FREE in Dr. Jones' Inner Circle! Plus, I will answer any specific questions you have (which you will submit via our Livestream Question Form on the Inner Circle). And of course, every session is recorded so you get access to all replays, for as long as you remain a member. After your first free month, the ongoing membership is only $9.97 per month, charged automatically to your credit card or PayPal account. And if you choose not to remain a member, you can cancel your membership anytime from within your account or by just sending us an email - and we'll cancel your membership right away, no hassles, no questions. Yes, Dr. Jones - I want the FREE DVD now! I understand that my order will be processed on a 100% secure server, with 256 bit encryption. I understand that for just the cost of shipping and handling, I will receive the Healing Your Pets At Home DVD, delivered to my door. 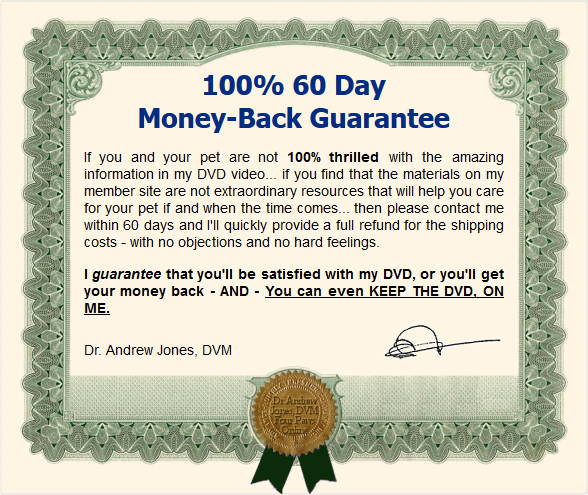 I understand that I have 60 days to test each and every bit of information on Dr. Jones' Healing Your Pets at Home DVD, and if I and my pet are not 100% thrilled with the amazing information, I'll get a full refund - and even if I request a refund, I can KEEP THE DVD - 100% FREE OF CHARGE. I understand that there are NO STRINGS ATTACHED - I WON'T be charged for anything else - NO ONGOING PAYMENTS - just the cost of shipping. By clicking the box above, I have chosen to get a Free 1 Month Membership in Dr. Jones' Inner Circle, that will renew automatically at the regular price of $9.97 per month at the end of the Free month. I understand that I can cancel my Membership any time. Obviously, there's no risk involved - only security and peace of mind. Click above to get your copy of the DVD today! P.S. - I know that if you have read this far on the page, then you really are devoted to your pets and you want to give them the best possible care. My materials will allow you to give every available treatment option for your pet if they become sick. It also will help you prevent diseases so your pet is less likely to become ill and require veterinary care. So why wait? Order now and you'll be prepared for whatever the future brings to you and your pet. Click here to get your FREE DVD today! P.P.S. - This DVD is FREE - You only have to pay the ridiculously low cost of only $4.97 to cover shipping and handling - ORDER TODAY! P.P.P.S. - I have a no-questions-asked 60 day Money Back Guarantee. I am a real Veterinarian (I am the previous owner of the Nelson Animal Hospital in BC, Canada), and I back up my product 100% - You will receive a full refund if you are not thrilled with the information. Remember that the DVD is yours to keep, no matter what. Are You Ready to Order Dr. Jones' FREE DVD? Looking for Dr. Jones' Free Videos? Go here. Previous subscriber - already have the Healing Your Pets At Home DVD? Just looking for Dr. Jones' latest DVD? Want to Know How You Can Heal Your Pet at Home Now? 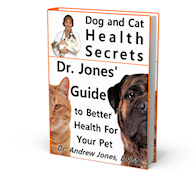 Get my FREE eBook: "Dog and Cat Health Secrets"